The 2018 Solo 618, now back for year two, looks to build on its success from last years introduction of the Solo 617. Structurally, the 618 is essentially a carryover of the 617. It does incorporate new graphics, a smaller knob and one new handle feature to help reduce vibration on impact. If you don’t need the newest model and those features aren’t deal-breakers, you can grab last year’s BBCOR 617 for $225 on Slugger.com (as of 9/29/17). The Solo’s graphics, along with the Prime 917 and Omaha 517, share a clean family look to keep things consistent. It uses a white base and is complimented with gray, black, red and a hint of neon yellow color pop that carries over elements from previous years. The handle to transition area starts with a matte black and moves into the white gloss for a little bit of texture difference. The family look isn’t flashy, but provides a clean and classic, good-looking set of bats for the 2017 line. For 2018, the Solo introduces a new, smaller knob than the one is used on the 617. Personally, I welcome smaller knobs on non-wood bats as they usually don’t provide as much rub on your bottom hand versus the larger size. It also uses a slight handle taper which is fairly stiff, which I assume is designed out of rubber. This taper helps take the edge off of the knob for players that enjoy a little something extra on their bottom hand. The biggest draw in this area of the bat is the custom Lizard Skins grip. Lizard Skins is one of the biggest aftermarket grip suppliers in the business and for good reason. In fact, in an upcoming report from WPW on MLB gear, 26% of MLB starters have used Lizard Skins in 2017. They feel great on bare hands if you’re not a BG guy, but also interact with pine tar very well if you do wear them. A lot of players rip stock grips off as soon as they get the bat out of the wrapper, but with a built in Lizard Skins, there won’t be any need. The sound of the Solo on impact produces a nice loud ping that puts it in the same conversation as the Velo, which is known for its piercing sound. If you want that special sound when you hit a laser, the Solo won’t let you down. Last year in our interview with Jim Earley from Louisville Slugger, he said that the Solo would be the lightest swinging one piece aluminum BBCOR bat on the market. While that was a huge obstacle to overcome, I fully believe that they accomplished just that by using a combination of their their SL Hyper Alloy along with the Speed Ballistic End Cap (SBC) made out of lighter composite materials. Adding the Speed Ballistic End Cap allows the Solo to have an extremely low MOI (moment of inertia) & swing weight that will play well in just about any type of hitter’s hands. Like the Rawlings Velo (review here), the Solo was super easy to swing and get the barrel through the zone. With the Solo being a light, one piece aluminum, you will get some vibration when you make impact towards the end or the handle. Slugger listened to their hitters and decided to reduce that vibration without making any structural changes. To accomplish this, they now use a gel-like substance within the handle to diminish some of the excess vibration before it reaches the hands. In our testing we did note a small reduction in vibration, but it is still present. The feedback that one piece aluminum bats give off can be seen as negative or positive depending on what type of hitter you’re talking too. A younger hitter may not want to feel anything when they hit while some high school & most college hitters actually prefer to know exactly where they made impact. Since the Solo has such a low MOI, I wasn’t sure how it would perform in the field compared to other established BBCOR models. After a few swings it was evident that the Solo could not only hang with the competitors, but also exceed them in certain situations. With low swing weight, it allowed me to have superior bat control and extra time to decide whether or not the incoming pitch was a strike. It also felt like I had a better chance of placing the ball where I intended on the field. With the Solo, you’re giving up a little mass behind the ball in favor of greater bat speed. The Solo 618 presents itself as an option for a wide range of hitters. While it won’t be right for everyone, especially stronger players with elite bat speed that can handle higher MOI bats, it could find itself a home with most players. The fact that it comes in a 29/26 & 30/27 is huge as it will give players transitioning into BBCOR a good bat that they should be able to handle at the plate. New for this year, the Solo will be available in senior league models: a USSSA -10 2 3/4 along with a -11 2 5/8 USA Baseball version. 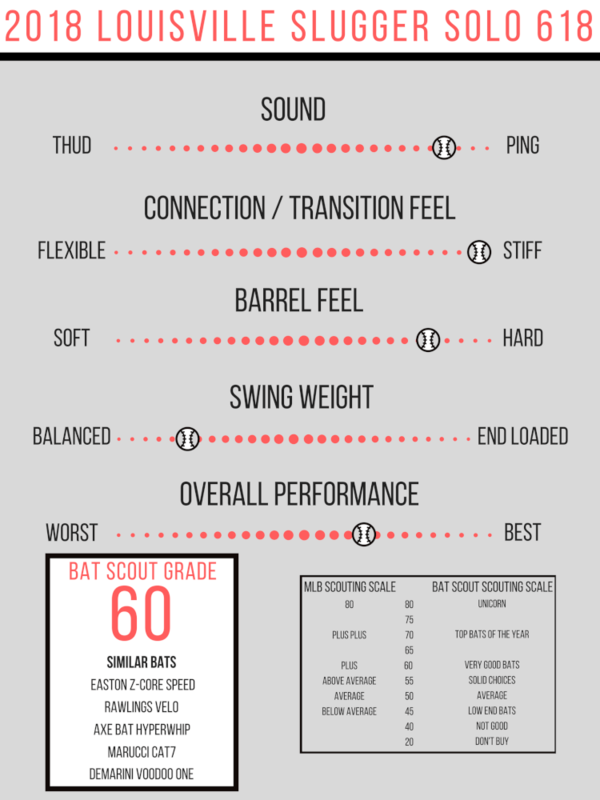 If you’re also considering the Rawlings Velo (check out our review here), you definitely need to give the Solo a look this year. You can shop all versions here.